A perfect piece to represent the show. Kudos Marq, just so good! oompa loompa doobity dank! choco-tastic brown paper and….. everything!!! Screw the chocolate…I want a golden ticket! Imagination delivered yet again…beyond my my wilds dreams. Love the use of color. So vibrant! Nice one for sure. I WANT ONE NOW!!! These prints for this tour have been amazing.. This print in particular is a absolute stunner. Great Job Marq! Wow!!! You knocked it out of the park Marq! Hope you can throw one to the side for me! 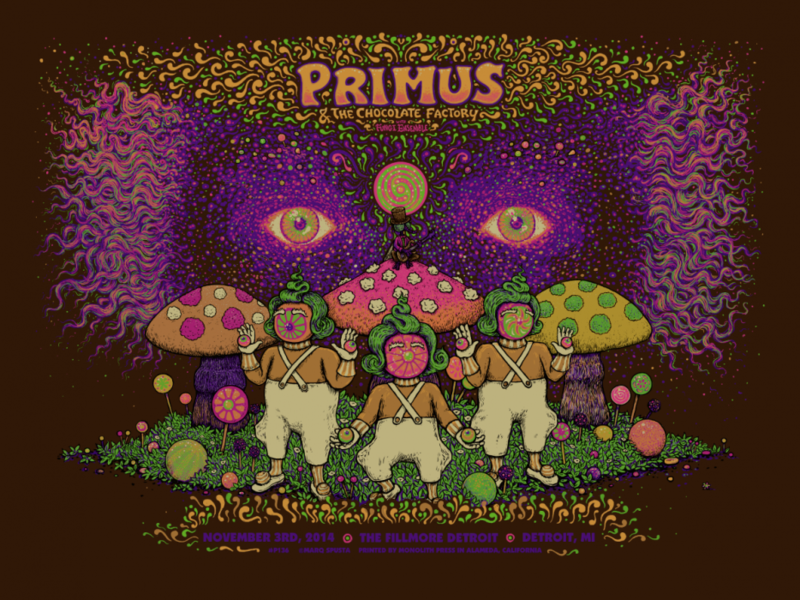 Will this Platinum Award Primus poster be available to the lowly losers anytime soon Marq? Tom Petty says that “Even the losers get lucky sometimes”. You took something predictable( wilder,wonka) and unpredict it .masterful. Say, could you sell me an extra one you got laying around? Pretty please!?!? Lol…. idonttrustzuckerberg. perhaps I should open a shill facebook account just to be able to be part of the Spusta madness. Stunning detail in person. The gold version looks great! Very proud to be able to own a copy! So happy to see that a lottery is about to pop off. It has been too long since Ive fed my Spusta monster.